The reigning champions were due to welcome Bohemians to Oriel Park while the Leesiders and UCD were also scheduled to do battle. Neil Farrugia has been called up to the Republic of Ireland U21 squad. TWO SSE AIRTRICITY League Premier Division fixtures featuring Cork City and double champions Dundalk have been postponed due to international call-ups. Dundalk were due to take on Bohemians in a crunch game on Friday 22 March at Oriel Park while Cork were scheduled to travel to UCD for a Premier Division fixture on the same date. Additionally, the clash between Sligo Rovers and Waterford has also been postponed due to call-ups on Stephen Kenny’s Republic of Ireland U21 squad, as his side prepares to welcome Luxembourg on 24 March at Tallaght Stadium. Ireland have been drawn into Group One alongside Italy, Sweden, Iceland, Armenia and Luxembourg for the upcoming Uefa U21 European Championship qualifying campaign. 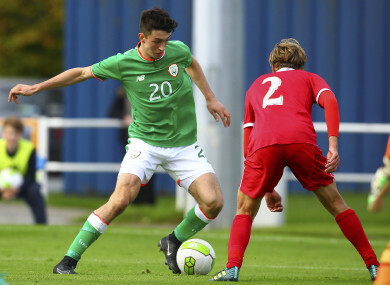 UCD pair Liam Scales and Neil Farrugia have both been included in the Ireland squad ahead of the Luxembourg tie, as well as Darragh Leahy and Dan Mandroiu of Bohemians. Waterford duo Aaron Drinan and Zach Elbouzedi have also been named in Kenny’s selection. The three postponed Premier Division matches will be re-fixed at a later date, with Bohemians currently sitting in second place on the table, two points ahead of Dundalk. Cork City are further back in seventh while UCD are struggling at the bottom of the table after picking up just one point from their first five games. Following the news of those postponements, the Munster Senior Cup final between Cork City and Midleton will now take place instead at Turner’s Cross on 22 March [kick-off, 7.30pm]. Email “Cork City and Dundalk's Premier Division games postponed due to international call-ups”. Feedback on “Cork City and Dundalk's Premier Division games postponed due to international call-ups”.